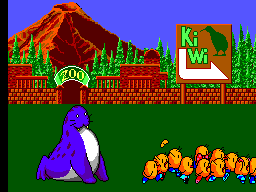 "Life in the Zoological Gardens of New Zealand's North Island is happy and carefree for Tiki, his girlfriend Phee-phee and all of the kiwi colony until Wally Walrus comes to town. Suddenly feathers are flying as Wally captures the defenseless kiwis and carries them off to cages hidden in zoos and parks all over New Zealand. The poor kiwis are trapped, as they await their terrible fate as the next course on Wally's fresh kiwi menu! However, while Wally is busy thinking of his next meal, our quick thinking hero, Tiki, escapes and plans a rescue mission to save his friends and beloved Phee-phee. A quest against time begins as Tiki battles with Wally's villainous friends through the maze-like worlds of NewZealand's zoos, finally coming face with the evil Walrus for the battle of his life." 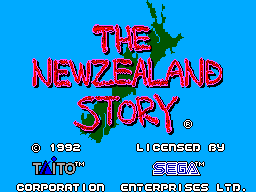 The New Zealand Story is a 1988 coin-op by Taito that became an immediate favorite of many gamers. Simon Freeman and Karen Mangum from Tecmagik are responsible for the amazingly good SMS port. The game is a direct port of the arcade game, and very little has changed gameplay-wise. 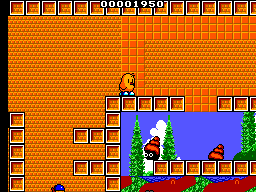 For the few who don't know, it's a typical Taito cute platformer in the vein of Rainbow Islands, but with multi-scrolling maze stages and with a lot more emphasis on shooting action. Your hero is an heavy armed bird that can use arrows, lasers, bombs and fireballs to destroy the evil guys. Plus, he can fly once he gets the right vehicles, such as air ballons. And he can even swim underwater for a limited time, and squirt water to his opponents! He's a tough guy, really! The gameplay is intact and the game is fun to play as every bit as the original. The biggest change in the SMS version concerns the difficulty, and is not a welcome one. I am really puzzle at how this could have been possible but you start the game with 3 lives and no continue at all. You are given an extra life at 50000 point and then every 20000, and you'll get some credits if you manage to beat stages 2-4 and later 4-5. It won't be easy. Keep in mind that there are 21 stages in total. In the arcade you can continue as long as you insert coins; the NES version wisely offers unlimited credits, while other versions (Turbografx, Megadrive) do give you at least three or five continues to start with. Ok, so maybe unlimited credits make the game too much of a cakewalk, but Tecmagik must be a bunch of masochist to not include some from the beginning. I didn't even find a stage select cheat or else, so I hope you're equipped with an action replay or reaching the evil Walrus might be quite a task... Other changes from the arcade worthy a mention are the lack of the "extend" powerups and some enemies that were removed. Also, like any other home version, the tiny map at the bottom of the screen is missing, and this can be annoying since later stages tend to be huge. I'm sure you SMS fans have seen often the SMS doing better than the NES. But, have you ever seen it outdoing the Megadrive and PC-Engine? Here is it: this port is nothing short than phenomenal. Graphically it's by far the best 8 bit version, and easily leaves the NES and even Turbografx ports to dust! The amount of colour and detail used rivals with the megadrive version but the SMS one sounds better (!). Add that the megadrive version is not a direct port of the arcade, and you have the SMS version as the best console port, hands down. Maybe some home computers (X68000) have a pixel perfect port, I don't know. Ocean's Amiga version was competent but nothing special, I remember. Anyway kudos to Tecmagik for this outstanding achievement! I think every fan should at least try this once to see what the SMS was really capable of at the end of its lifecycle, when it's pushed to its limits by talented programmers. The music you'll hear during the whole game is nicely done; they however truncated its original length (cutting off the melodic part) and as a result of this it gets repetitive very fast. Add that it never changes and you'll want to mute your tv soon. The sound suffered most during conversion, and definitely is not this cart's highpoint. Legendary Tim Follin did the music for the NES version and I must say it's a lot better than this one. Control is tight and your Tiki is very responsive. The action is fast and furious and can get really manic when the screen is loaded with enemies! Overall it's very well executed, no complain of sort. Be aware however than in the most chaotic situations the graphics will suffer: you'll se no flicker, but you could not see the arrows you shoot anymore. This is however a rare occurrance, so it doesn't detract from the experience. The fact that you're given just three lives and no continues at start means that you'll have to sweat a lot in this game. This could motivate you to keep doing better and better, until you master every level. But it's way more likely that it will make you totally hate the game instead, refusing to touch it again. Newzealand Story is clearly a game good while it lasts, and the danger with this port is that it may last forever. From a technical standpoint, this game deserves a perfect 10. It is no Power Strike II, but it still is one of the most visually stunning games you can get for the SMS. So, it's really a shame that with only a bit of adjusting it would have been perfect in every possible way. The game is too short to require a password system, but I really feel some extra continues wouldn't have hurt. As it is, it can get really frustrating, especially in the later levels. Highly recommended for those who want a challenge, but everyone should give it a look, because it's a Taito timeless classic very fun to play.